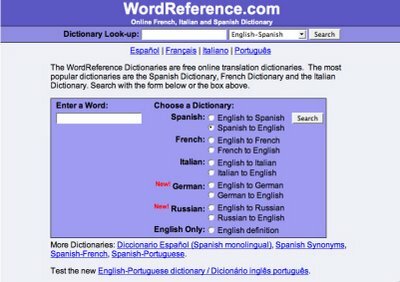 Are you interested in a good online dictionary? Click here. In addition, in wordreference.com there are forums where you are likely to find the meaning of words which you may not be able to find in your dictionary and you can also ask about those expressions you don’t understand. You can find a lot of English dictionaries on the web, but the most impressive about this one is the amount of people from all over the world writting in the forums trying to help others. This is a "must visit" for any English student, or just in case you have a mental blackout. Greetings from Madrid Isabel! It's always a pleasure find interesting things like this on your blog.